It’s must-win time for the Oakland Raiders (5-6) this week when they face off against the hapless New York Giants (2-9) at the Oakland Coliseum. This game has been given wide coverage in the media, not because it’s vital for the Raiders to win if they want to keep the playoff hopes alive, but because it’s the game where we’ll see Giants quarterback Eli’s manning consecutive start streak come to an end. After 210 consecutive starts throughout his career, Giants head coach Ben McAdoo has decided to go with former New York Jets quarterback Geno Smith as the starter. 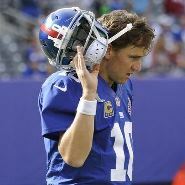 Eli’s streak is the second longest in NFL history as he trails only the 297 consecutive starts of Hall of Famer Brett Favre. The Good news for the Giants is that the Raiders will be without their two best wide receivers in Michael Crabtree and Amari Cooper. Crabtree is serving a two-game suspension after his fight with Denver Broncos cornerback Aqib Talib in last week’s game, while Cooper will be out as he’s dealing with a concussion and an ankle injury. Tight end Jared Cook and wide receivers Cordarelle Patterson and Seth Roberts, therefore, will likely be among the main targets for Raiders quarterback Derek Carr. With Crabtree and Cooper out the Raiders will also rely more on the rush, where running back Marshawn Lynch will see the bulk of the carries. “Beast Mode” carried the ball 26 times against the Broncos last week and if he gets that many attempts this week expect him to have a very productive day against the Giants as they allow 131.7 rushing yards per game, which ranks them 31st in the league. To have any chance of winning this game the Giants need to have a running back with 20 carries or more this season. They are 2-0 this season when a rusher hits the 20-carries mark, and both those games were against the Broncos and the Kansas City Chiefs, who also happen to play in the AFC West along the Raiders. The Raiders problem is that they rely too much on Carr, so if the opposing defense finds a way to neutralize him you can expect the Raiders to lose. In the Raiders five wins he’s had a passer rating of 99 or more, but in the five games he’s lost (he missed a game due to injury) his rating averaged just 71.9. The receiver situation will make it tougher than usual for Carr and company to win this game, but the Raiders should win as they are the team still fighting for a playoff spot. With Lynch leading their ground attack and their defense not having to worry about Eli Manning the Raiders will find a way to win this game and keep their playoff hopes alive for at least another week.